Hello readers! I am writing this post on Saturday, as I won't be home on Sunday. I have scheduled it to be published on Sunday, so I apologize if something happens between the time I am writing this and the time it gets published. (Although I doubt it, since nothing usually happens on weekends on Stardoll.) Also, unfortunately, there was no update on Stardoll layout and new featured, as we expected. Well, better luck next week. But before that, let's see what events were the highlight of this week. It started with a promised release of new Rio collection ob Monday. The long white skirt seemed to be the most popular item from the collection, seeing many members styled it fantastically in comment section. There are few starcoin items, and 2 nice blazers. (Though I don't get the price difference between them, as they are basically identical.) Hm, what else? Yeah, the short gold dress, perfect for those special occasions. What are your favorites? Another offer from Stardoll - a nice, trendy bag, a gift for making a purchase. Even it may seem Stardoll keeps spamming us with those offers, making us make a purchase, it is actually nice idea. For some members who purchase stardollars or superstar membership every once in a while, it can influence them to do so and get a nice gift. The bag is really, really cute, although some members had a problem of pattern not showing up on a bag. It is fixed now, I think. Again, nice offer, but I think they could have included the dress Miley was wearing with that bag. Stardoll seems to be releasing new collections of this store often, so there isn't much I can say without repeating myself. Though I am not a big fan of this particular collection. Yeah, I like some items - few dresses and few pairs of shoes, but that's all. Wishing for a better new collection, but not too soon please! On Thursday Stardoll announced April HotBuys. I am really not a big fan of those. According to way they look on the pic, I won't be buying any single piece. Okay, maybe only black long boots. I was kinda hoping for a spring themed HotBuys, some pastel, spring colors. Not this. Just no. A long awaited Super Suprime limited collection finally arrived on Friday. 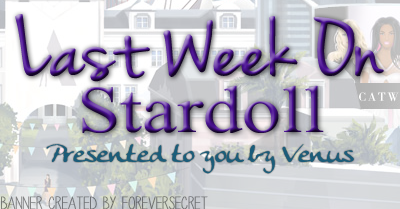 Yeah, quite a busy week, but again, I was expecting Stardoll update they hinted. Well, maybe next week. Or month. Don't get your hopes up. But before that, it is a time to chose your favorite moment of a week. I am really curious to see what will you chose. So vote, and see you next week.